The church has now established an AmazonSmile Account to benefit the missions of the church. Amazon donates .5% of the price of your eligible AmazonSmile purchases to the church. AmazonSmile is the same Amazon you know and use. Same products, same prices and same service with no cost to your for the benefit to LOUMC. Visit https://smile.amazon.com. If you are prompted to log in, you will use your same account you normally use on Amazon.com. The accounts are the same regardless of which address you visit and all of your orders can be viewed in either place. On your first visit to https://smile.amazon.com search for "United Methodist Church of Lake Orion" as your charitable organization. Note: if you are referring anyone else to use the program the exact order of words is not important, however you won't be able to find us under "LOUMC" as you must search with our official registered name. After finding us and selecting us a your organization of choice, you will be give a confirmation stating you know you have to visit https://smile.amazon.com for the orders to have the donations made. That's it! You're all set to use AmazonSmile! Just remember to visit https://smile.amazon.com whenever you start shopping. Thank you! What if this is not my first time using AmazonSmile? That's OK, it's easy to change your designated organization. 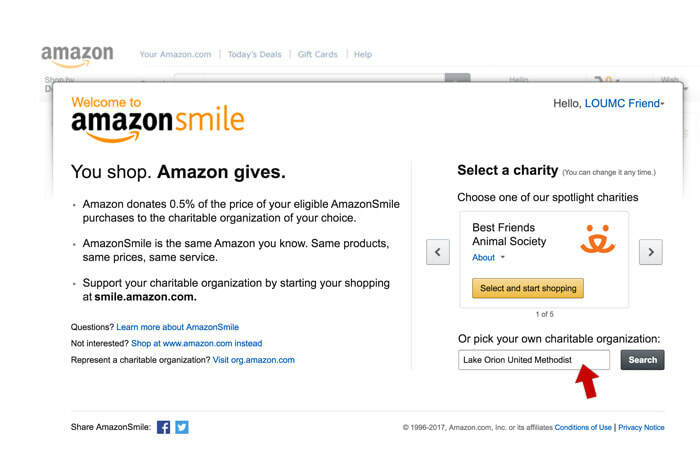 Visit https://smile.amazon.com, select your existing organization at the top, click "Change" and search for our organization just like above.